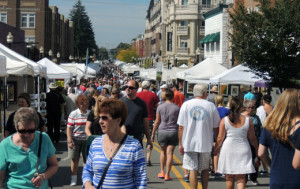 This 18th Annual event returns to Main Street in Downtown Carmel, Indiana on Saturday September 26, from 10:00 AM to 6:00 PM, and Sunday September 27, from 10:00 AM to 5:00 PM. Born from humble beginnings – the first event was staged at Carmel’s City Square – this year’s event will feature over 130 juried artists exhibiting in watercolor, oil, 2D, jewelry, photography, 3D, wood, sculpture, pottery and more. The event is now in their seventh year of holding the festival in the Carmel Arts and Design District. Admission continues to be free for the weekend event. Along with the tempting food vendors, festival goers can sample the Arts and Design District’s outstanding restaurants and visit all the local shops. Family attractions include the Young at Art station and the popular exhibit, the Young Artist Tent. This will feature the exceptional talent of our high school art students in Carmel. This is a festival renowned for diverse artistic styles. This year’s entertainment spotlight features The Ballet Theatre of Carmel. musical guests include The Emily Ann Thompson Band and Slammer Jazz. Link to the Carmel International Arts Festival Entertainment Line-up.